We landed in Havana in Cuba and wanted to explore the nightlife, the real Havana … Not the typical “tourist ” offering but something genuine and authentic that the locals would enjoy …. Isn’t that what we are all looking for? We see the tour guides in their branded polo shirts with their clip boards and we reject them, knowing you are just getting the “tourist” serving, the typical places who are all probably taking you to the spots that are expensive opposed to the genuine , authentic places. What’s more in some places you know they will probably get a few quid for bringing a group there. So … Off we walk, avoiding the taxis , heading down a road to the “old town”. In no time at all a friendly couple start chatting to us, asking about where we are from and generously telling us about their lives …. They seem to know we want the “genuine” experience and guide us to a little bar where and old musician is behind a keyboard, who was from the original Beuna Vista Social Club! Before we can scratch we’ve bought two rounds of drinks , which for some reason ended up being more expensive than the five star hotel, we’ve bought a CD by this old codger and we’ve bought cigars (don’t smoke, never will!) ….. Hmmmm, a genuine “authentic” Cuban experience. The following morning (after being conned again in the street by a young woman who didn’t want money for herself but wanted some help for her baby … All of this happened in just 10 minutes while we were simply trying to buy a bottle of water…long story !) we opt for a tour from the hotel with a tour guide, which was really great. He did give us good tips about being conned by people on the street! The big problem with searching for the “authentic” is that it is often so hard to find. Delivering it and packaging it properly in a way that people will recognise is that little bit of illusive magic that will keep us from being conned and deliver the best possible experience. I must head out now to find an authentic Cuban restaurant, it’s probably out there but we’ll never find it! This entry was posted on May 26, 2012 at 8:33 pm and is filed under Hospitality, Marketing, Tourism, Travel, Uncategorized. You can follow any responses to this entry through the RSS 2.0 feed. You can leave a response, or trackback from your own site. Great story Greg. Thanks for sharing. My wife and I and 4 friends had a similar experience a few years ago in Mexico. Seems it doesn’t matter if you’re on-line, off-line, in your hometown or halfway across the world, it can be hard to find “authentic”. Cheers!! thanks Trich – it was all good ! Hope you are enjoying Cuba. 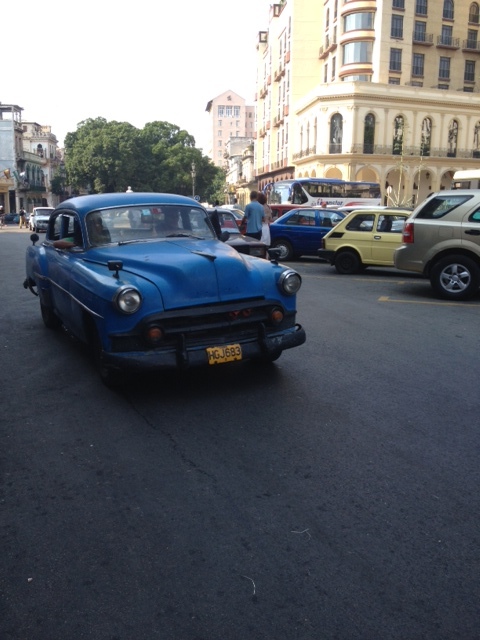 Its very hard to get away from the hard sell in Havana – sounds like not much has changed since I was there! If you are travelling outside of Havana you might get a better opportunity to experience the real Cuba. Staying in Casa Particulars are a good way to experience the real Cuba. Have a great trip! Thanks for the recommendations – we got to a resort outside Havana and unfortunately didn’t get to see too much of the authentic Cuba! My boyfriend was in Cuba many years ago. He was staying with local families who had rations for food – getting an egg was difficult. But despite their poverty, he said they were always honest and happy. I really wish I had the license to go there.